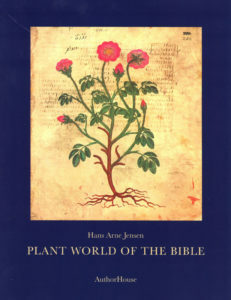 Plant World of the Bible. Hans Arne Jensen. Author House Publishing Company. $57.98, softcover; $3.99, E-book. 2013. www.authorhouse.com. Given my lifelong fascination with all aspects of natural history, and with plants in particular, any mention of plants in historical accounts or the Bible has always caught my attention. Such botanical references help to paint a picture of the environments and cultures surrounding events that took place long ago, and the interactions of ancient people with familiar plants provide us with shared experiences that make those people seem less distant from us. Biblical references to well-known plants such as olive trees, figs, lentils, or wheat are quite clear, but sometimes the plants in the Bible are unfamiliar to us, or the names in the Bible are not the names commonly used today. And some biblical stories don’t make much botanical sense. The author has compiled a carefully researched, comprehensive listing of the nearly 100 varieties of plants mentioned in the Bible. For example, as any experienced gardener will tell you, mustard seeds are not the smallest of all seeds, and mustard plants grow only about two to eight feet tall, not the size of trees! I’ve always assumed something must have been lost in the translation, and that the mustard of the Bible was surely not the same species we call mustard today. Hans Arne Jensen clears up some of these mysteries in his Plant World of the Bible, … and does much more. The author has compiled a carefully researched, comprehensive listing of the nearly 100 varieties of plants mentioned in the Bible. For each plant or, in some cases plant product (e.g. resin, or balm), the biblical references are quoted, and archeological and other evidence supporting a probable identification of the plant are discussed. Additional information, varying a bit from plant to plant, typically includes descriptions of the plant, human uses of the plant both in biblical times and today, and other interesting tidbits. The plants are listed alphabetically according to the English names used in the Bible (making this book a useful reference to have at your side while reading the Bible). Each plant is listed by both its scientific and current English names. Readers who are well versed in botany, plant taxonomy, horticulture, or natural history are sure to find much of interest in this book, and will probably enjoy reading it cover to cover. For general readers without high levels of botanical literacy, this probably won’t be a book to snuggle up with in front of the fire, but it will still be of great value, as it will serve as an invaluable reference to have at hand while reading the Bible. The book includes many illustrations (some dating back to the first century BC! ), but all readers will find it useful to research the plants further to better understand and visualize them. It provides the critical information on plant IDs necessary to explore further with Google searches. So have your computer or smart phone by your side as well to make the most of this book! Regarding those mustard seeds, though the author does not address the matter of mustard not growing on trees, he does explain that while mustard seeds are far from being the smallest of seeds, they were among the smallest of commonly planted agricultural seeds at the time. I was a little sad to not have the mustard mystery fully solved for me, but this book contains a great wealth of information to interest a wide range of readers. Bill Capman is associate professor of biology at Augsburg College in Minneapolis.